0.5 to 1 lb. per 1,000 sq. ft.
Tempo 1% Dust is a ready-to-use pyrethroid dust that can be used for both indoor and outdoor applications. It can be applied using a hand duster or power duster directly into voids and cracks and crevices, in and around structures. Tempo 1% Dust has excellent penetration into wall voids, ensuring equal coverage, and is odorless and non-staining. Tempo 1% Dust makes pest harborages uninhabitable, and is an ideal solution for penetrating cracks, crevices, and other hard to reach areas. 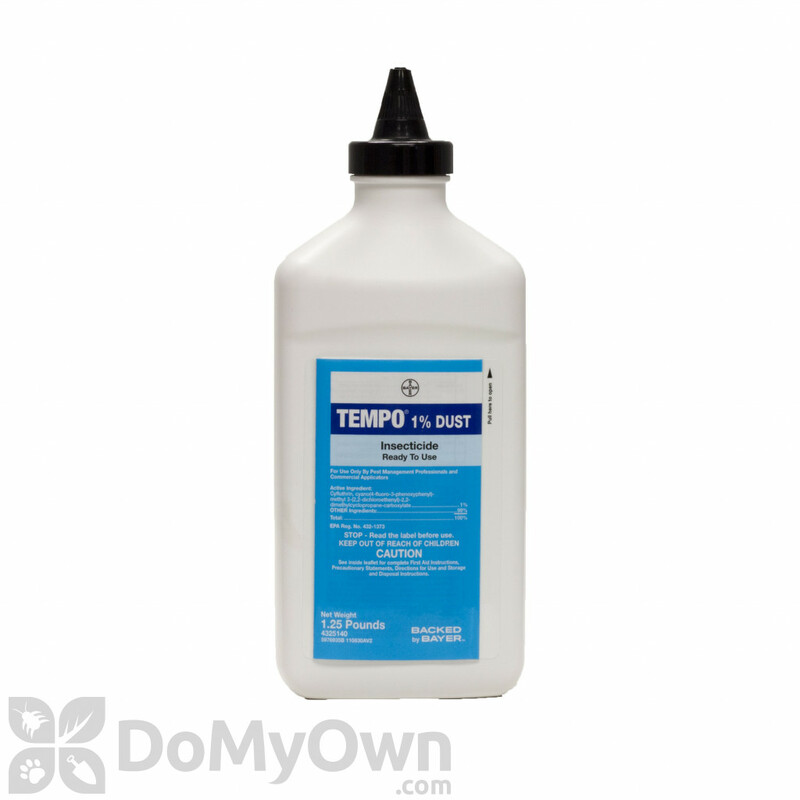 Tempo 1% Dust is an "all around" dust that provides a long residual against a variety of perimeter pests, especially stinging insects like bees and wasps. Use a hand duster to make application easy in those hard to reach areas like cracks, crevices, base boards or wall voids. I also had yellow jackets up in my soffits. The local Pro service wanted $140 to get rid of them. I found this awesome website and ordered the Tempo 1% dust and the $14.95 bellow hand duster. I dressed up like a space alien for protection and gave them a few good shots of dust late last evening. I was a little worried at first because it did not kill them instantly on contact like a jet spray. They were swarming around the opening (and me) pretty well even after I dusted them. But today after work I looked and they are all gone! Plenty of dead ones on the ground and none flying around anywhere. I saved around $100, I now own the hand duster, and I have plenty of the Tempo dust left over. Glad I found this place! The ONLY thing that worked. I saw this product online with these great reviews. I had to try it as it was my last hope. I had a huge yellow jacket problem. At first I tried to let them coexist. I then tried to control them by eliminating the nests as I spotted them with OTC sprays. I hung a OTC trap in an effort to control them. This year, they got especially aggressive and stung myself and my father in law. Their stings were very very painful. I now know why they are called the devil's insect. The final straw was them building a nest under my shed. This was a nest I could not physically get too. I knew it was getting bigger and bigger as more and more activity continued around an opening. In a matter of weeks I would see constant swarming yellow jackets going under the shed floor through a crack. I tried dousing with spray and spraying into the crack. This just made a few die and get the rest extremely angry. I tried sealing it with bricks and preventing entry. They still found a way through the tiniest of cracks and actually moved gravel. They were VERY motivated. I ordered the dust and crossed my fingers. After the first dusting I wasn't sure if it did anything. I waited 2 days and still saw activity. On the 3rd day, I waited until nightfall and planned my second dusting. I pulled back a brick to examine the hole and sure enough there were probably about 50+ dead yellow jackets all on the ground. They were still getting in but dying on the way in/out. I applied more dust. This time getting all of the perimeter of the shed. Next day, no yellow jacket activity. They got the hint. I even spotted a dead yellow jacket about 25-30 feet away from the opening! The devil's insect terrorized me for a good 3 months and kept me from even going into my shed. Thank you so much it is such a relief to finally be able to enjoy my own yard. Use Tips for Yellow Jackets: Apply at nightfall. I can't stress this enough. You are less likely to be stung at this time. Activity is way less. Still be VERY careful. Even at night, one of the worker friends didn't appreciate the forceful dusting and popped his lovely head out to say hello and chase me. Buy a duster. Only way to make it work. I used the cheapest bulb duster I could find here. It dispersed it pretty dang far. A little goes a long way and I probably went overkill a bit with 2 dustings. I wanted to be sure though as I can't see the nest and wanted to cover the perimeter for permanent treatment. Even then I didn't even use much compared to what they send you. Don't count on it killing on contact like the spray. Remember this is a permanent fix. Not just a "spray them they are dead." The sprays are good for visible nests. Spray and knockdown. If you are dusting and they come out to say hello, you should make a hasty exit and try back another time. Service here was great. If I ever need anymore, I will always by from domyownpestcontrol.com! I had (key word is HAD) a yellowjacket problem under the aluminum siding of my house. I could see where they were entering, but couldn't get to the nest, so I drilled a hole through the siding into the space just under the window and tried using a straw to inject liquid and foam insecticides. It proved ineffective, so I mixed up a batch of seven (the hardware store assured me it would kill the bees), stuck my sprayer wand into the hole and drenched it with about a half gallon of the mix. I'm sure I must have killed a few of them (perhaps they drowned), but I was unimpressed and still had a bee problem. Then I found this website and what they said made sense to me. I bought Tempo 1% dust and a duster and went after the wasps. I dusted the openings and dusted in the hole I had drilled in the siding. It took a day or two for the yellowjackets to track the dust back into their nest, but it did an excellent job of eradication! There was a marked reduction in wasp activity within 24 hours and a complete kill in 48. Best product I have ever used. Make sure to use a breathing mask and gloves as the dust is so fine you will undoubtably breath in some of it and it's a bit rough on the lungs. I had a 10 minute coughing fit after using it, but I'll be smarter next time. After all it really is harder on the bees than on me! LOL! I only used a few ounces of the dust so there is alot left over for future needs. Thanks guys, I appreciate you site and products. Tempo 1% Dust Did It! I just wanted to let you all know how well the Tempo Dust got rid of the hornet and yellow jacket problem in my soffits. I had tried so many things to get rid of them – OTC jet sprays, Delta Dust, foggers, and even paint thinner! The problem was I did not know exactly where the nest was in my soffit. I just puffed Tempo Dust around all the crevices to my soffits where they were getting in last night and now there is no insect activity this morning! Thanks again for your products and prompt delivery. This product has saved my life from bedbugs. When the product arrive, I couldn't wait to use it. I ordered this product and the bellow duster. Before using it on bedbugs, I went on using it on cockroaches in my kitchen. I live in a apartment where the manager doesn't really do much. She has only fumigated the kitchen for cockroaches maybe 3 times in my 20 years of living. The exterminator didn't do a good job. Cockroaches aren't my big concern since they aren't the ones biting me at night but once I puffed around the kitchen, cockroaches started to appear out of their hiding areas. This product is amazing! I puffed under the stove, under the refrigerator, under the cabinets and in the crevices where I would see them flee. The cockroaches kept coming out and coming out. They would climb up the ceiling and then fall right straight down on the floor. It has gotten rid of a lot of cockroaches. And the plus side to this product is that it stays active up to a year. I do recommend buying IGR since cockroaches make eggs and this can't kill the eggs. Once I started seeing the cockroaches crawling up to the ceiling and then dying, I didn't want to be near the kitchen. So I started my bed bug extermination. I began my room. I puffed in the crevices of the wall. I opened up the outlets and puffed in the walls too. I put the pipe of the duster between the wall and the carpet. I puffed the whole room against the carpet and the baseboard in order to get any bedbugs underneath the carpet or in the baseboard. I did the same thing to the rest of the apartment. Later on in the evening, I found a bedbug crawling up the wall with some white dust on it. It was wobbling. I have left the dust around for 2 months now and I have been able to sleep. Haven't seen any bedbugs or bedbug feces. I gave this thing a week to say if it worked or not because having bedbugs has been traumatizing. I even bought tempo sc ultra and IGR just incase it didn't work. IT WORKS!!!! Thank GOD!! I have been living with them for 2 years and now I thank GOD and Domyownpestcontrol for this product!!!. I'm planning on using this product for a year since the building is having bedbug problems. Forgot to mention that before using this product, the building sent an exterminator a total of 8 times in 2 years. I noticed that the exterminator was just not doing his job, he cared more about making a bigger profit than having the customer happy. That's when I decided to do research on doing my own extermination and I found this website. How can I kill wasps that are nesting behind soffits or shutters? I've seen several wasps going behind the ribbed gaps between the aluminum soffit and the facia. I've also seen several going behind decorative window shutters. It appears that we have a fair amount of wasp actvity in our area. I'd also like to know how to prevent them from nesting in the furnace inlet/exhaust pvc pipes or the chimney flue. Thanks for your help! We recommned that you use a hand duster and apply a dust such as Tempo dust to the holes where the wasps are going in and out. The dust will help eliminate the wasps in the nest and any other wasps returning to the nest. Tempo dust will stay effective for several months as long as it is dry. We are not aware of a product that would eliminate the wasp pheromone to help stop wasps from returning to a particular area. After dusting in the void where the wasps have a built a nest you can try spraying the siding with a product such as Talstar P. You can spray once a month and any wasp that lands on treated areas will be eliminated within about 24 hours which should stop new wasps from being able to build a nest. Is this the best insecticide dust to use on our bee wasp hornet or yellow jacket problem? We have a bee/wasp/hornet/yellow jacket problem. In other words, we are not sure about the critters, We believe they are wasps. Some of the hives appear to be in the ground, and others in the usual areas. Will this product work on all of the above, in case we are wrong about our assumption? Also, will it work for the hives that are underground? Yes, this is our most popular dust for bees in general. Wether they are in the ground or in your home going under a roof shingle, or a paper nest out in the open, one to two quick puffs from this dust will knock them out. You should get a hand duster to apply the product. Also, it is best to apply the dust late at night or very early morning when the bees are less active. Night usually works best. How long does Tempo 1% dust stay active inside a closed wall? 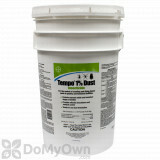 Tempo 1% dust can remain active up to a year if left undisturbed in a wall void. How do I use Tempo Dust to get rid of a bee or wasp nest? Is the Tempo 1% Dust effective if the nest cannot be found and it is assumed the bees are either in the wall or ceiling? If dusted in the openings, will the bees take the dust into the nest to kill all off? Yes, the Tempo 1% Dust is our best selling product to eradicate bees. If you know where the opening is where the bees are going in and out, and you dust that opening, the bees will get the dust on the hair on their legs and carry it back to the nesting area. Usually this will eradicate a bee colony within 24 - 48 hours depending on the size. It is best to treat the opening late at night or very early morning when they are all inside and less active. What is the best way to get rid of wasps under siding? Wasps are nesting under the vinyl siding of my home, where the foundation meets. I've tried sprays but find I must invert the can to reach the nest. When I invert the can and spray, all I get is the aerosol, no poison. I've tried pumping diatomaceous earth into the area, but I'm not getting to the nest and the powder is obviously missing at least some of the wasps. I need an effective poison with a delivery system I can use close up and spraying upward under the siding at about 3-4 inches off the ground. Our most popular dust for bees/wasp is Tempo Dust. You will need a hand duster to apply it with. It usually works within 24 to 48 hours, and will provide a better transfer effect that diatomaceous earth. You want to go up to the opening where they are flying in and out of at dusk or at night when they are not active and puff twice directly into the hole. Then pull the duster out and puff directly at the hole to cover the opening from about 5 inches away. This is the most efficient and fastest way to eliminate a bee/yellow jacket/wasp nest.